For nearly a decade, Butcher Babies have been crushing stages worldwide with their vicious live performance and explosive energy. Their stage presence is a hypnotic spectacle that leaves audiences hungry for more. Frontwomen Heidi Shepherd and Carla Harvey, guitarist Henry Flury, bassist Jason Klein and drummer Chase Brickenden juxtapose brutal, aggressive riffs with beautiful melodies that wail with emotional redemption. 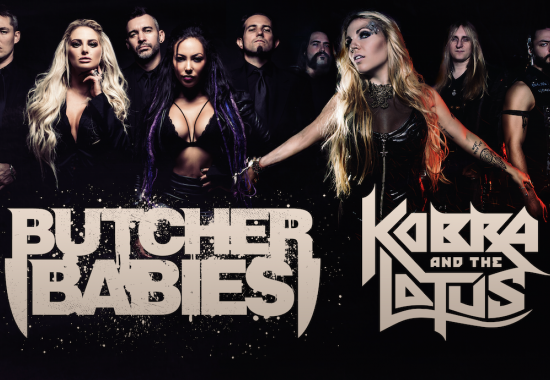 Hailing from the City Of Angels, Butcher Babies aided in the jubilant revival of the Metal scene on the Sunset Strip. While gaining attention from several record labels the band signed a worldwide deal with Century Media Records in December 2012. Less than a year later, July 2013, they released their debut album GOLIATH, produced by Josh Wilbur (Gojira, Lamb of God, Hatebreed). Followed by their highly anticipated sophomore headbanger, TAKE IT LIKE A MAN, August 2015, produced by Logan Mader (FFDP, Gojira, Soulfly). The evolution continues as the band is set to release their third full studio album, October 27, 2017, LILITH, produced by Steve Evetts (Suicide Silence, Dillinger Escape Plan, The Cure). With three albums and two EPs under their belt, Butcher Babies have reached a new level of maturity solidifying a triumphant return after a brief creative hiatus to write and rebuild. LILITH opens with a kick right to the teeth with the aggressive Burn the Straw Man, then drips with sensuality on tracks like Headspin and The Huntsman, pairing riveting guitars with velvet vocal harmonies. This album runs the gamut between exploring the dark roots of lust and the high energy thrash hijinks that Butcher Babies have become known and loved for. Butcher Babies have toured relentlessly among the likes of Megadeth, Rob Zombie, Marilyn Manson, Five Finger Death Punch, Danzig, In This Moment, Cradle of Filth, Black Label Society, etc; played music fests including Mayhem, Download (UK), Hellfest (France), Knotfest (US & Japan), Hell and Heaven(Mexico), Rock on The Range, Louder Than Life, Aftershock, Welcome to Rockville, etc. and appeared in the film Alleluia! : The Devils Carnival.